The 2019 event was unique in many ways. Held only in Peru, featuring a shorter 5,000-kilometre route and staged over 10 days, it produced some extremely close racing and results. With the majority of the timed special stages held on the soft sand dunes of the Peruvian desert, good navigation and overall strategy were unquestionably of equal importance. A start position further down the field would allow a rider to ‘push the tracks’ and make up time on the riders ahead. In contrast, a stage win would mean opening the next day’s route and invariably losing time to the competitors behind. With his participation initially in doubt following a training accident just weeks before the event, Toby Price arrived in Peru with the modest goal of simply completing the rally and backing up his teammates as best as he could. As the race progressed, the physical strain was obvious with his injured wrist becoming more painful with each passing stage. Gritting his teeth, the 2018 FIM Cross-Country Rallies World Champion nevertheless made the start of each stage and put in solid performances to lie in an impressive fourth overall at the rest day, halfway through the rally. Going into the second week, the tough and testing conditions started to take their toll on the competition and their machines as Price moved up the order. Going into the final day, Toby had a one-minute lead over the then second-placed Pablo Quintanilla. The two friends and rivals would both have to ride their absolute best on the short 112-kilomtere special to be in with a chance of the win. Unfortunately for Quintanilla a crash just 10 kilometres into the stage ruled him out of contention while Price, after stopping to check his fellow competitor was ok, went on to win the stage and ultimately the rally. 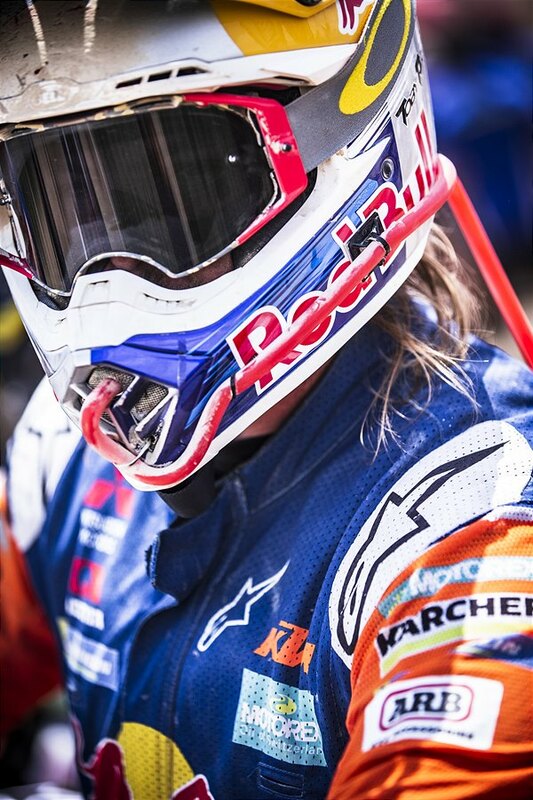 Clinching his second Dakar title, Toby attributed his win to the support of both his fans and, most importantly, the Red Bull KTM Factory Racing team. 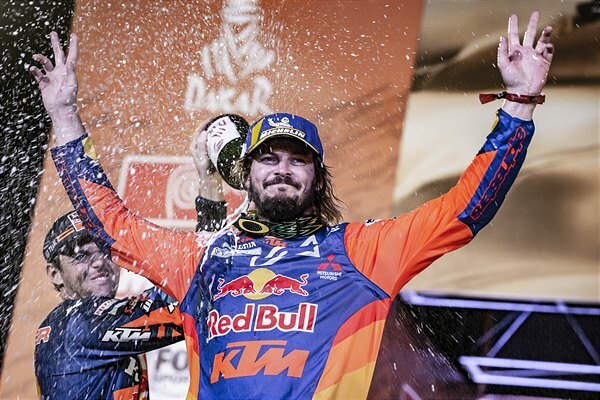 With Toby’s victory handing KTM their 18th consecutive Dakar Rally win, success earned in Peru was, as in previous Dakars, the result of a true team effort. Pit Beirer (KTM Motorsport Director): “For us it’s another special moment, especially going into the new season, as all the racing world is looking at the Dakar. It was a very, very tough race – listening to the riders so far it was the toughest they ever went through. It’s just such a long fight, and we always prepare and hope with our riders. We struggled with their pain, but at the end of the day we could turn the race around another time and to win it with such a dominating result is just incredible. 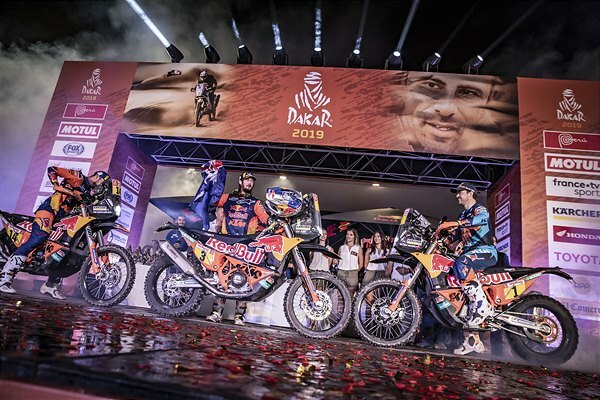 “Toby has defied the odds – while it was looking like it may not be possible for him to start this year’s Dakar, winning together was something we could only have dreamed of. His fighting spirit to the final kilometre with the injury he has is remarkable. “The one-two-three may look easy on paper, but if you follow the Dakar and how difficult it was to reach this result it’s amazing what our people are doing – the bike preparation, logistics, trucks, physiotherapy and everything behind the scenes are all important. I really want to thank our fantastic team, it really is the number one team in the world – how the guys prepare for the Dakar, how the engineers build the bike, how the riders do such a fantastic race. 2018 Dakar winner, Matthias Walkner rode to an excellent second place overall, despite injuring himself during the early stages of the event. A hard landing from a dune resulted in a painful, swollen ankle but it didn’t slow the Austrian’s pace as he went on to claim two stage wins at the gruelling event. Following nine days of racing, covering 5,000 kilometres, Walkner was just six minutes down going into the final stage. A third-place finish on stage 10 secured Matthias the runner-up position in the final rally standings. In what was an up-and-down rally for Sam Sunderland, the Brit kept his composure and kept on battling right to the end. Stopping to assist a fallen rider on day five, Sunderland went on to win the stage after having the time lost reallocated to him at the end of the day. With the following day’s stage being long and especially tricky to navigate, Sam put in an amazing ride opening the stage but ultimately placed 12th, losing 22 minutes to his rivals. Fighting back, the 2017 Dakar winner never gave up and, with his persistence paying off, secured an overall third place result at the chequered flag. 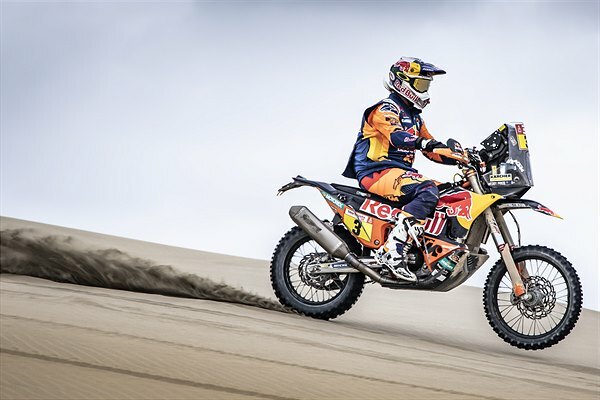 Arguably putting in the ride of his career, Luciano Benavides justified his position within the Red Bull KTM Factory Racing squad with a superb eighth place in what is his first ever Dakar finish. Showing increasing speed and maturity throughout the rally, the young Argentinian became a regular top-10 finisher and in doing so, a great asset to the team. 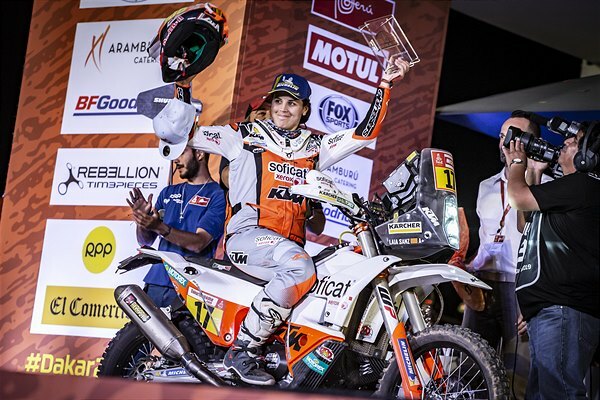 Laia Sanz, ‘Queen of the Desert’, once again put in an awe-inspiring display as she rode to 11th place overall in what is her ninth consecutive Dakar finish. Halfway through 2018, Sanz was diagnosed with the Epstein Barr virus, making it extremely difficult to do any training at all, on or off the bike. Coming into the event, the Spaniard’s goal was simply to successfully complete the rally with no thought about her overall position. Day by day, the KTM Factory Racing rider’s consistency, mental strength and navigational skills rewarded her with one strong result after another. Narrowly missing out on a top-10 overall position, Laia was over the moon with her performance. 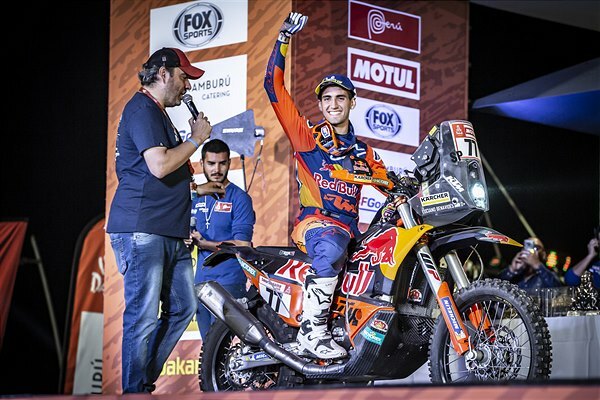 Mario Patrao did a fantastic job for the KTM Factory Racing team, especially aiding the other riders at the halfway stage of the event’s marathon stage where no outside assistance is allowed to competitors. Unfortunately, a fall on stage six brought an end to the Portuguese rider’s race. We wish Mario all the best with his recovery. The next event for the Red Bull KTM Factory Racing rally riders will be round one of the 2019 FIM Cross Country Rallies World Championship – the Abu Dhabi Desert Challenge – held March 30-April 4 in the United Arab Emirates.